The Elite was a typical American light steam car, differing only from the general run by its ornate bodywork and profusion of brass on lights, dash, hubs, and steering tiller. It used a 2-cylinder engine, and a gasoline car with similar body was also listed. 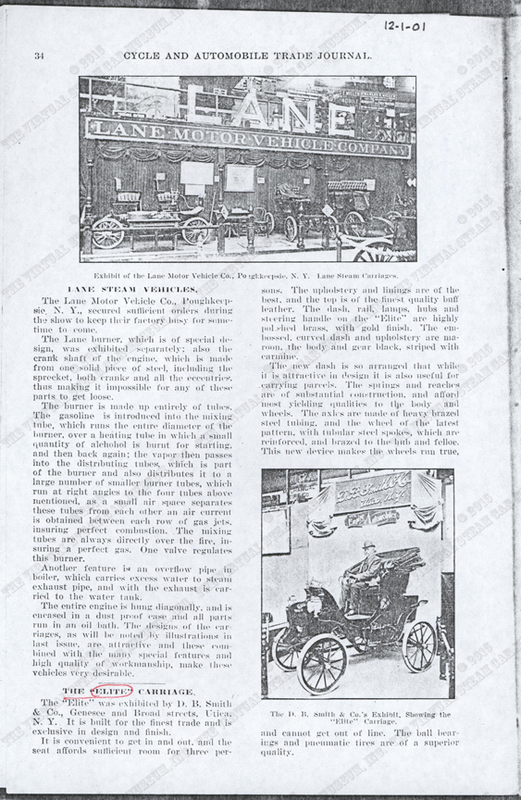 The D. B. Smith & Company's Elite Steam Carriage shared page 34 of the December 1901 Cycle and Autoomobile Trade Journal with the Lane Motor Vehicle Company. What appears to be the last paragraph of the Elite Steam Carriage article suggests the company was about to introduce a gasoline automobile. John A. Conde Collection. 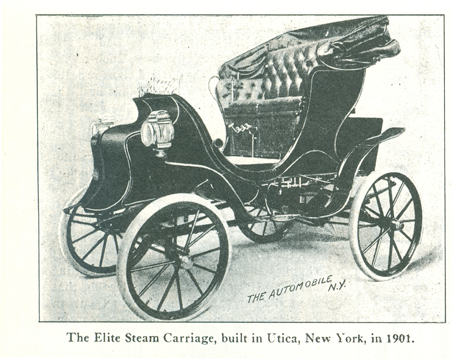 Floyd Clymer produced this 1901 image from The Automobile of the Elite Steam Carriage on page 43 of his Steam Car Scrapbook. Page 43. John A. Conde Collection. D. B. Smith & Company, Elite Steam Carriage, Conde's File Folder. John A. Conde Collection. Georgano, G. N., Encyclopedia of American Automobile, (New York, E. P. Dutton & Co., 1968), p. 71. Contact us if you have additional information about D. B.Smith & Company or the Elite Steam Carriage, or if you have questions.